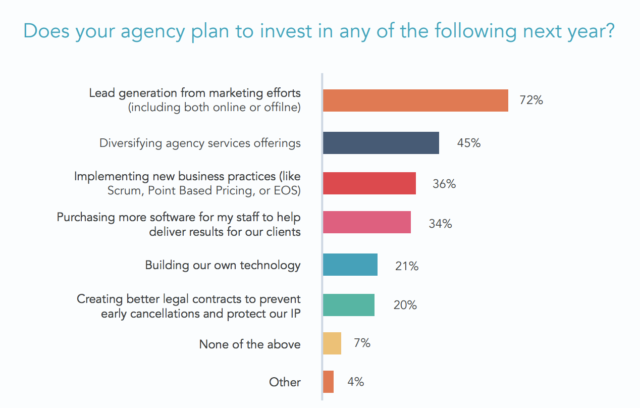 HubSpot surveyed over 1,000 agencies to uncover the most common priorities among agencies. 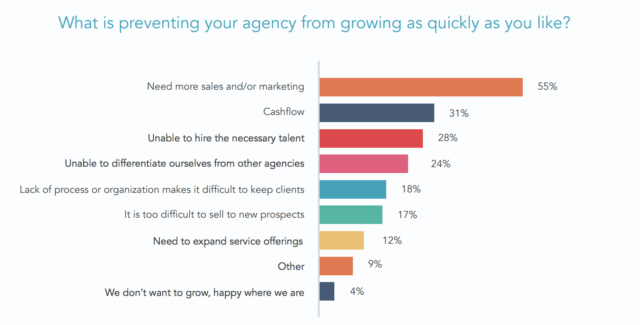 HubSpot recently released the results from their annual survey on obstacles that prevent agencies from growing. In their 2018 Agency Growth Report, they sampled over 1,000 agencies of all sizes to identify common trends in the strategies that agencies plan to use this year. 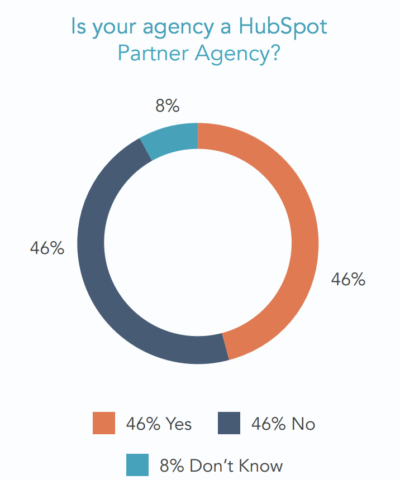 About 50% of agencies were members of the HubSpot Partner Program. And the headcounts of the participating agencies were representative of the digital marketing industry. Ironically, the number one barrier to agency growth was not enough time/money spent on their own sales and marketing! Although sad, this is no surprise since most agencies have to work on razor-thin margins, which leaves few resources to market the agency itself. Here are the 4 major insights I gathered after reading the report. 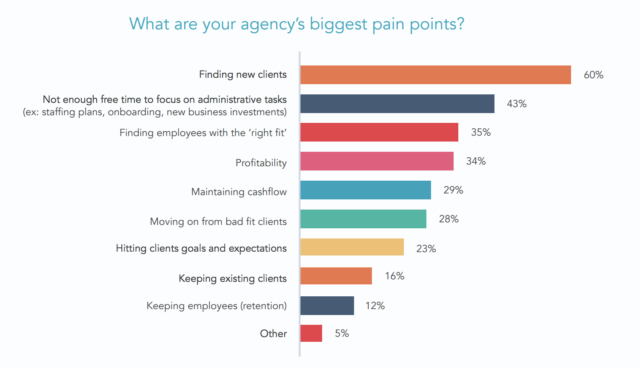 If you enjoy these data-driven reports, you might also enjoy the State of Digital Agency Report, which reveals what client-side marketers REALLY think about their agency partners. 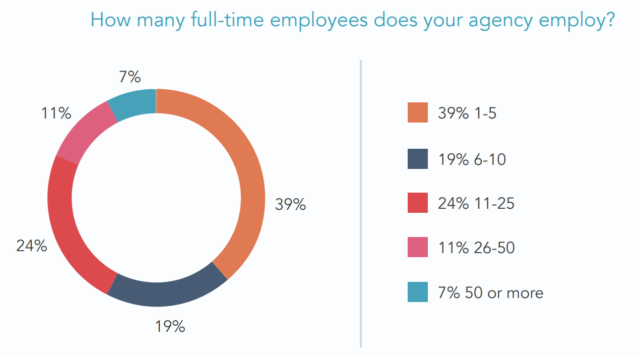 However, the second (“Not enough time to focus on tasks like staffing plans, new business investments”) and third (“Finding employees with the ‘right fit'”) most popular responses may provide some insight into why agencies never get around to “finding new clients.” When agencies do not have the time to focus on administering the business itself and struggle to find employees that have the ‘right fit’, they will not have any time to seek out new clients! Constant employee churn combined with little attention to creating ‘business building’ processes within the agency is a recipe for stagnation. When agency leadership spends all day on putting out internal fires and scrambling for new employees, they will not have time to build a brand and grow their presence in the market. We weren’t surprised to see these as issues. We have already surveyed members of the Databox Partner Program to learn how they address these challenges. They shared 20 agency software tools they use to improve the efficiency of all employees, as well as their favorite question to use in the account manager interview process. Unfortunately, most agencies are still struggling just to get leads. One reason that lead generation is so challenging is that it requires a sustained effort over many months, especially if you are using inbound marketing tactics. Sure, you can cold call or attend events, but you will be missing the opportunity to be top of mind from the very beginning of the buying process. Since many agency employees do not even have time to maintain the business, they probably do not have the time to put in that sustained effort over multiple months to generate a reliable flow of leads. If agencies chose to diversify their efforts to generate revenue across all 5 types of sales, they would put less pressure on lead generation, and could instead focus on generating more revenue from existing relationships. Agencies also mentioned “Implementing new business practices like Scrum/Agile marketing” practices to increase their efficiency and profitability. In our research, we’ve also discovered that many successful agencies have implemented agile, and are even employing agile marketing consultants and paying for points-based-pricing training to make the switch happen. 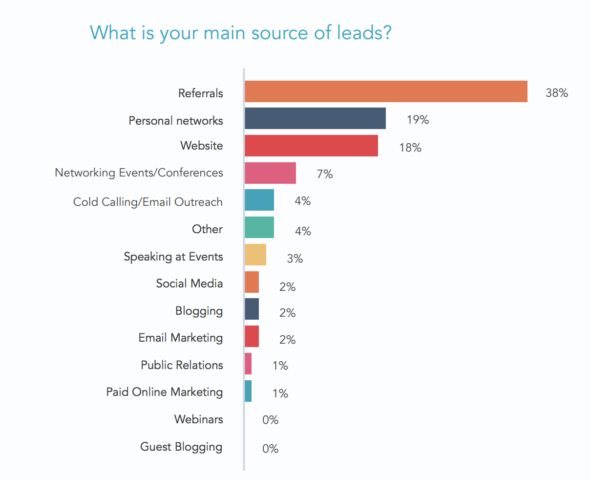 Yes, even though HubSpot surveyed digital marketing agencies, many of which are inbound marketing agencies, referrals and personal networks were still far and away the top source of leads. Considering that 50% of the agencies practice inbound marketing, I was surprised that the website only produced 18% of leads. But, it makes sense in the context of the previous statistics. In the survey, 80% of agencies reported that they currently use a project management tool. But, when those same agencies were asked about which types of tools would help better run their company, “project management” was still the most popular choice. 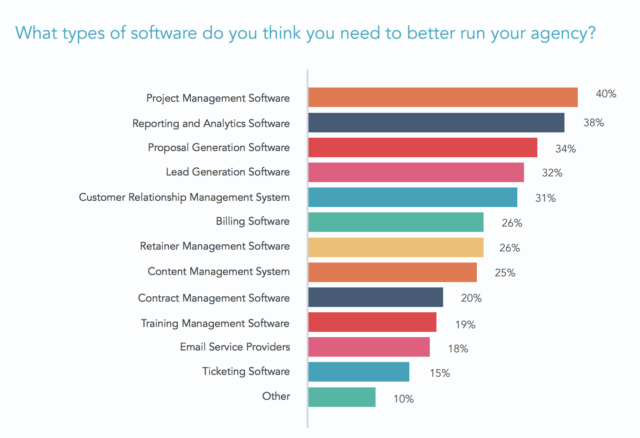 The second-most common tool needed to “better run an agency” by a narrow margin was “reporting and analytics software.” This was not surprising to us since Databox is the most popular reporting tool amongst HubSpot agency partners. At Databox, we talk with agencies all day about their business. We help agencies with their marketing and lead generation through our co-marketing. We help agencies with their reporting and upsell processes. We help some agencies use data in their sales process better. We train agencies on new services they can offer. As we help agencies implement our client reporting and monitoring software, we also see the challenges they face producing results for clients. Running an agency is hard. Growing an agency profitably is even harder. But, it’s not impossible. Through data like this report, it’s clear that agencies know what to do. It’s just a matter of doing it. Perhaps agencies need to get better at setting and hitting their own goals? In our experience, the ones who treat themselves like a client (and have the discipline to do their own marketing and sales week in and week out) have a much easier time generating leads and landing new clients. And the ones who are good at that, can be more selective about which clients they sign on. And as any agency employee knows, the better the client, the easier it is to retain and grow them.